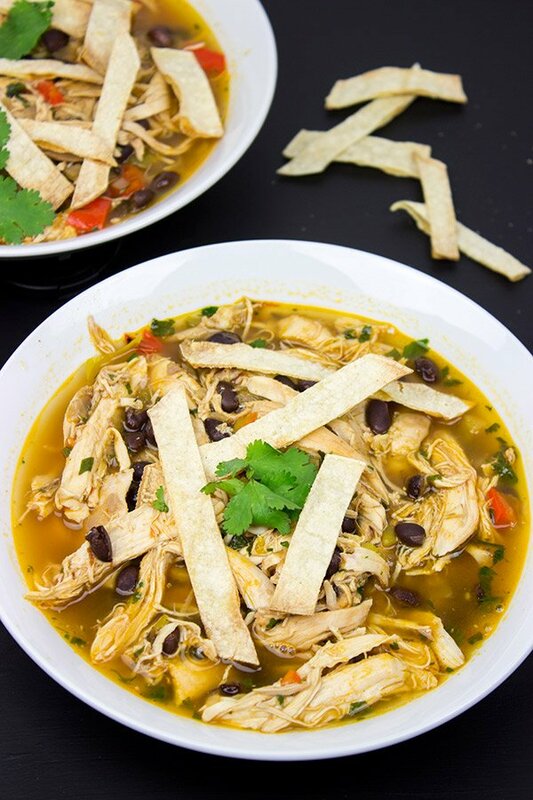 This Fiesta Chicken Tortilla Soup is delicious, healthy, and pretty darn easy to make! I know it’s starting to get warmer in some parts of the country, but it’s still soup season here in upstate New York. In fact, my wife and I just went skiing for the first time in years last weekend, and we had an absolute blast! Of course, we mainly stayed on the green beginner’s trails…but it was fun being out on the slopes again. (It had been almost 20 years since the last time I went skiing.) 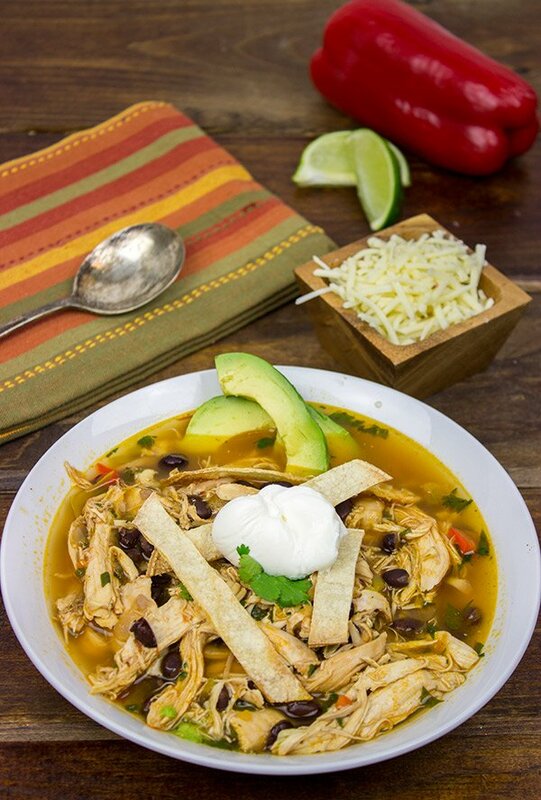 Whether your upcoming plans involve skiing or planting your garden, this tasty Fiesta Chicken Tortilla Soup is a delicious and healthy way to end the day! Back when I lived in Baton Rouge, Louisiana, I’d occasionally walk down to a Mexican restaurant with friends for lunch. Their chicken tortilla soup was always one of my favorite items on the menu because the flavor was both slightly spicy and slightly smoky. It’s been a number of years since I lived in Baton Rouge, and I had forgotten about that soup until I stumbled across a chicken tortilla soup recipe from America’s Test Kitchen that called for minced chipotle. That instantly reminded me of the soup from Baton Rouge, and I immediately started craving chicken tortilla soup! So I updated my own chicken tortilla soup recipe with a few of the ingredients from the one at America’s Test Kitchen…and just a short time later, this Fiesta Chicken Tortilla Soup was simmering away on my stovetop. Since this recipe calls for a small amount of minced chipotle, I wanted to include a quick note on it here. (Before I really started getting into cooking, I had no idea how to use canned chipotle in adobo sauce.) It’s most commonly found in the Hispanic/Latin food section at your local market, and it’s sold in a can labeled ‘chipotle in adobo sauce.’ Chipotles are smoked chili peppers, and they’re pretty darned potent. (Translation: you only need to use a small amount. 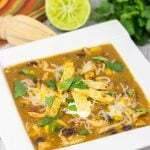 For example, this Fiesta Chicken Tortilla soup recipe only calls for about 1 Tbsp of minced chipotle.) So why are they sold in such large cans? I don’t have a clue! But what I do know is that they freeze quite well. Just transfer the leftovers into a small sandwich bag and store them in your freezer. One can will last you a long time! I’m always amazed at how easy it is to make homemade soup. I used to think it was a big, involved process…but it’s not at all! And a batch of this Fiesta Chicken Tortilla Soup makes enough servings for my wife and me to eat it for lunch all week long. It’s also a healthy balance to all of those heavy comfort foods that we crave during the cold winter months! 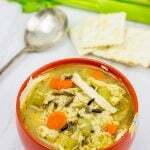 For other homemade soup ideas, check out these other favorites: Homemade Chicken Noodle Soup, Hearty Irish Potato Leek Soup, and Hearty Vegetable Bean Soup. 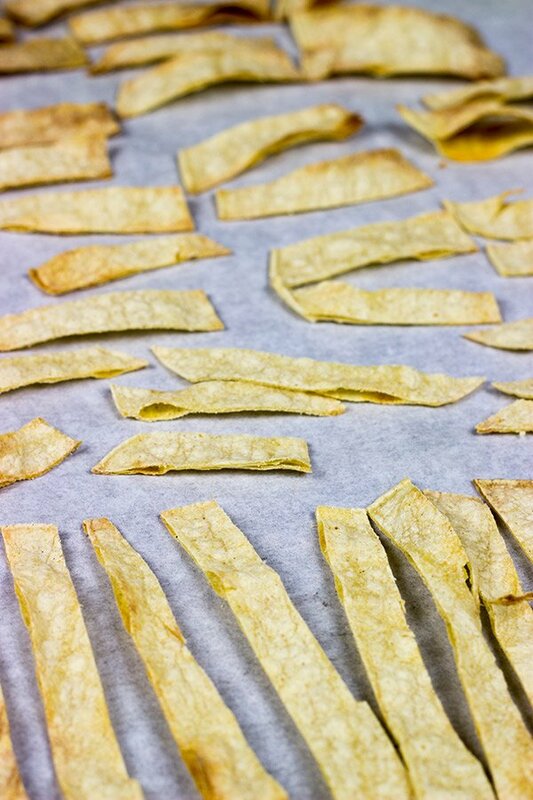 Place sliced tortilla strips on a parchment-lined sheet pan and bake at 450°F until crisp (~6-8 minutes); set aside. In a large stock pot or Dutch oven, heat the olive oil over medium heat. Once hot, add the diced onion, bell pepper, and jalapeno; sauté for 3-4 minutes. Add the minced garlic and continue sautéing, stirring occasionally, until the garlic turns light brown (~3-4 more minutes). Add the chicken stock, water, picante sauce, chopped green chiles, chili powder, black beans, minced chipotle, and chicken. Increase heat to medium-high and simmer for 20-25 minutes. Remove soup from heat and stir in chopped cilantro and lime juice. Top with baked tortilla strips immediately before serving. Garnish with additional cilantro, sliced avocado, Monterey Jack cheese, and/or sour cream (optional). I could so go for a bowl of this soup right now considering this random burst of winter weather we’re experiencing down here. Looks amazing, David! Oh man, even New Orleans is still stuck in winter-mode? I’m SO ready for the Spring!! Thanks for stopping by, Graham! Canned chipotle in adobo sauce adds so much to soups, stews and even stir frys – I simply adore it! I bet this tortilla soup tasted FANTASTIC!! This soup looks amazing! I might try it later in the week, as I have some black beans we just got from Field-goods. I love Mexican food, not tooo spicy of course. Happy St. Paddy’s Day, and may the temperature rise above 40 soon! Haha, yes. Corned beef and cabbage is absolutely a mandatory today. 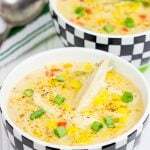 But this soup is really darned delicious…it’ll help you forget the chilly weather outside! Totally jealous about your weather over there! (Here’s to hoping that it stays that way.) And thank you so much for stopping by!! Oh, that house is still for sale. Just sayin’. And yes, it’s time to get warm. My grill is sitting out there looking all lonely and sad!